Password management… lets be frank… is a pain! It’s quite frustrating to remember every single password to all of my accounts. Some of you reading this might think that you should have one strong password across all of your accounts… well to put it nicely that is the dumbest thing you could possibly do. Actually let me take that back, having one of the most common passwords known to man is the dumbest thing you could possibly do. Having strong and secure passwords on different accounts could mean being safe from hacks, online scams, phishing, and log-ins to illegitimate websites. However, having strong and complicated passwords on many online accounts always means that some or even most of your passwords will be lost somewhere in your brain. This is where password management tools come in. The following resources can and will help you in almost every single password dilemma of the modern age. First let’s go back to the basics, and forger the Internet for a second. Writing things down on a piece of paper to revisit at a later date, is the most common way to store useful or important information. 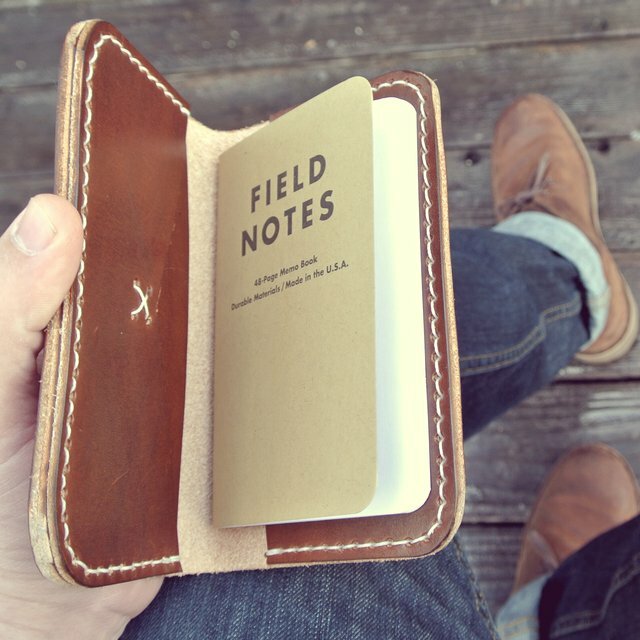 If you have good self-discipline, you can simply get a small notebook and write down every single passwords and username you currently have. This may be a very ‘old school’ way, however the risk of forgetting passwords is kept to a minimum. Additionally, the possibility of it being compromised is significantly reduced because the only ones who could get a hold of those written passwords are the ones who are in close proximity at your home or office. One thing to remember about using this password management tool is not to include VERY important passwords such as the log-in info of a primary email or an online bank account. Additionally, the written passwords should always be kept in a safe place where there is a minimal risk of losing it and/or a risk of someone else getting a hold of it. 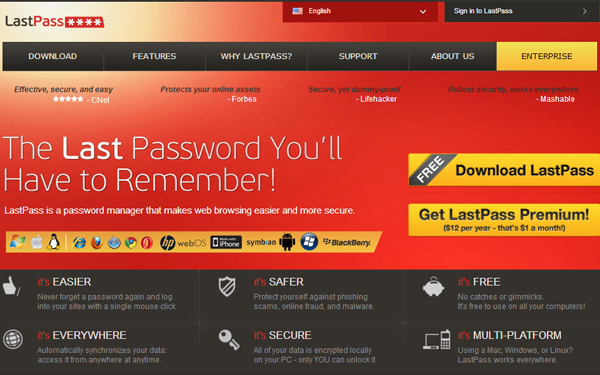 One of the more popular password management tools on the Internet, LastPass provides security while automatically logging you into different accounts without typing any information. With this tool, all log-in info is saved and stored in the cloud. There is nothing for you to worry about, your passwords will never get into the hands of any person other than yourself. LastPass can be used across different platforms. It works on Mac and Windows and on all major browsers such as Chrome, Internet Explorer and Firefox. 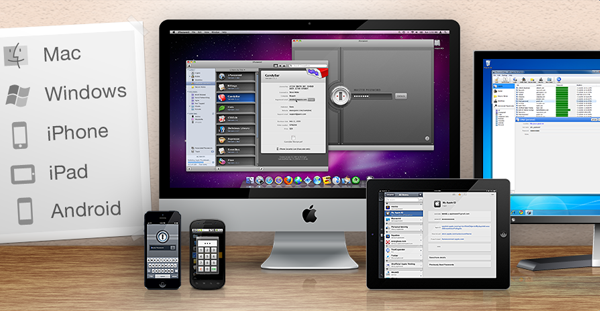 As the most agile solution of the five, 1Password is a tool that can help you when creating, managing, and securely accessing passwords on Android, iPhone, iPad and Mac devices (a beta version is available for Windows). This tool allows users to fill in passwords across the internet. 1Password is compatible with Google Chrome, Firefox, and Safari. It can fill in passwords on applications too. Additionally, it can assist in creating lengthy and secure passwords of your choosing. This tool stores all log-in information at a secure location on a user’s computer. There is also an option to store these via Dropbox, where you can sync your entire database of passwords across other platforms. 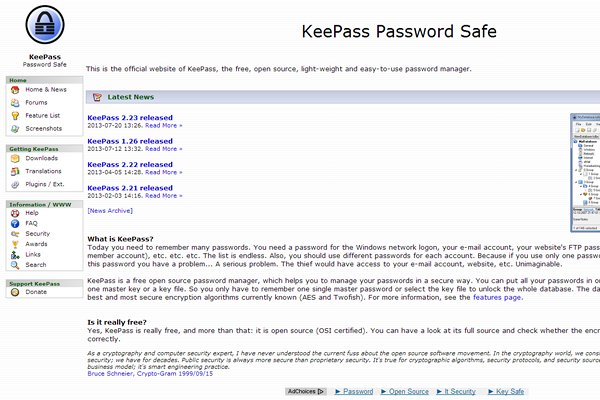 Being the only one that combines open-source and free usage, KeePass is another password management tool with proper security and safety. This tool saves all log-in info on the user’s computer which is securely locked with a master key. The key file or the master key is the only thing needed to access all saved passwords in its database. KeePass is protected with the best secure encryption using a series of algorithms and protocols which are termed Twofish and AES. It’s a portable application that can be carried on a USB stick. It can also run on Windows platforms without being installed. Lastly, this tool can also generate random and strong passwords, which any user can use. Previously known as Mozilla Weave, Firefox Sync is a tool for passwords, browser tabs, and bookmark management. This tool has a cool concept and takes, to some extent, a different approach from the other tools mentioned. With this tool, whenever a user logs into his or her account, they will have access to saved log-in information, be able to sync all the data, and even open tabs on another computer. However, when that user logs out, all the information disappears. Although Firefox Sync is limited to the Firefox browser, other browsers also have similar password tools. Browsers such as Google Chrome, Safari and Internet Explorer have their own built-in password tools. All of which have the basic auto fill-up feature. What do you find is the best way to keep your passwords?